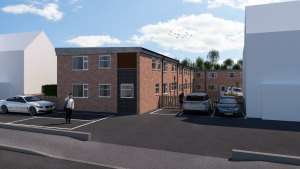 St Georges Courtyard in Hinckley is being offered with a *guide price of £1.5 million for 14 apartments that have been fully refurbished in a major overhaul of the building. Carl Finch, senior auction valuer at SDL Auctions Graham Penny, said: “St Georges Courtyard is an L-shaped building originally built in the 1960s that had grown tired and outdated. “The current owners have invested heavily in a total renovation and modernisation and this is now a fantastic investment opportunity for the bidders at our November auction. The property is offered with vacant possession and would be an ideal buy to rent investment giving an estimated rental income of £100,000 per annum. St Georges Courtyard is situated in Hinckley town centre, next to the new £60 million pound Crescent development comprising of bars, restaurants, shops, micro pubs and cinema. The rest of the town centre is a two minute walk away along with schools, parks, doctors and the train station. London St Pancreas is less than 1 hour away. Carl Finch said: “The town is home to major business with a Tesco Distribution Centre, Mira, Centrica and a DPD depot which create a huge number of jobs and therefore the rental demand in the town is extremely high.